I love starting my weekend with a trip to the farmers market. I may start the day overwhelmed by my to-do list, but everything slows down as I start to walk past the tables of vibrant produce, local honey, and artisanal breads and cheeses. Connecting with your food and those who produce it makes you pause, breathe, and appreciate the great gift of real food. You know you’re doing something better for your body and planet by going fresh and local. However, you can’t take for granted that everything at your local farmers market is good for you and the planet. Supporting your local farmers market can provide better quality produce and be beneficial to the environment and local economy. However, it is not a guaranty that the produce is free of pesticides, meets safety standards, or that the product is actually from a local source. If you’re not taking the opportunity to get to know your farmer you may not be getting what you bargained for. 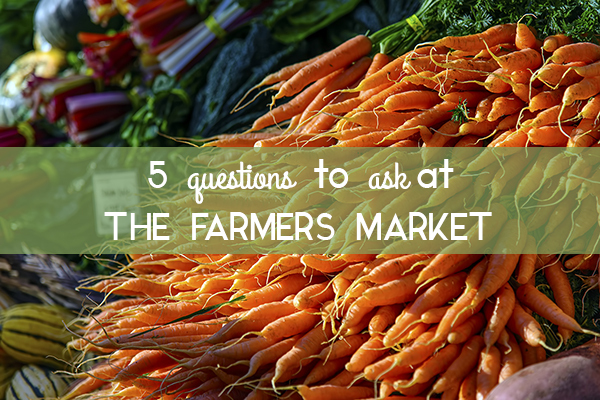 Here are some questions to ask at your next (or first) farmers market visit. Not every local farmer grows organically. Those who do so often proudly display their USDA organic label. If you don’t see the organic label, you need to ask how they spray and fertilize their crops. Some farmers use all organic methods but simply do not have the resources to obtain the organic certification. Others may use conventional methods of pest control and fertilization. If it is a fruit or vegetable on the Dirty Dozen list, make sure to choose organically grown produce. WHAT DO YOU FEED YOUR LIVESTOCK? Local and grass fed seem to go hand-in-hand but you can’t assume that is the case. Cows and chickens may still be eating grain due to cost and land availability (or even junk food!). They may also still be getting things you don’t want in your food, like antibiotics. Organic eggs may be the best protein choice at the farmers market. They can be used in a variety of ways and can be less expensive per serving than organic beef. WHERE WAS THIS ACTUALLY PRODUCED? It is pretty obvious the seafood at my local farmers market had to travel quite a distance to landlocked Missouri. Most farmers post where they are located but, depending on market rules, that doesn’t mean all of their products come from their farm. If something seems unusual for your location, ask where it was sourced. I don’t believe any of my local vendors would want someone to get sick from their products. That doesn’t stop me from wondering about the cleanliness of their facilities. It’s important to understand if they are trained in the proper food safety procedures and if they are being inspected to ensure this. Regulations about who has to be inspected vary by location so check your local laws and ask before you stock up on strawberry jam and honey butter. CAN I PICK BERRIES OR APPLES AT YOUR FARM? Shopping seasonally can be easier on the budget, but not everything is less expensive at the farmers market. If you’re budget conscious, ask if the farm has days where you can pick your own produce. Often the “pick your own” price is less expensive due to saved labor and transportation costs. The good news is most of your farmers market vendors are more than happy to chat with you about what they do and give you a sample or two. That’s what makes the farmers market so great – the sense of community. Most farmers are proud of their product and are more than happy to share their knowledge and expertise. They also love to hear what you are going to do with their mushrooms or kale. Take a moment to slow down this weekend and get to know your farmer. Stroll, sample, and appreciate the season’s freshness. Just remember that the locally made organic cookie is still a cookie! All things in moderation, even at the farmers market!